It was bound to happen. All those animal and military coming home videos on Facebook have been expanded to be realized into a feature film. 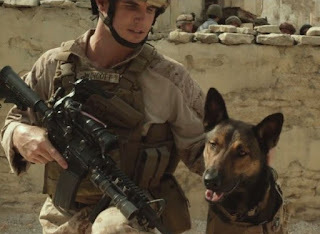 Director Boaz Yakin who also wrote the script with Sheldon Lettich over sells the story of a service dog who has been trained to seek out explosives. Part of the trailer stresses that animals can also experience PTSD (post traumatic stress syndrome) just like humans. That angle was only touched on briefly in the story that was mired down by a contrived gun running plotline with one of those “Father Knows Best” sort of Texas down home families even while it was filmed in North Carolina. Max, a Belgian Malinois dog (looks like a German Shepard) is the loyal hard working service dog trained by Marine Kyle Wincott (Robbie Amell). His buddy Tyler (Luke Kleintank) is all sorts of sketchy that even the dog looks at him askew. Kyle is on to Tyler stealing weapons from the hidden stores of the enemy that Max uncovers. His greed and the need to cover up his crimes gets Kyle killed and he tries to off the dog too. Max gets sent back to Texas and the trainers take him to Kyle's funeral where he throws his grieving doggy self on the casket. The Marine trainer (Jay Hernandez) tells the family that Max has been hard to handle of late, but when he meets Kyle's younger sullen video playing brother Justin (Josh Wiggins) he immediately senses the same chemistry of Kyle. Mom and Dad (Lauren Graham and Thomas Haden Church) agree that Max is now family, although he has to stay chained up in the yard. Justin meets Carmen (Mia Xitali) the cousin of his self effacing best buddy Chuy (Dejon LaQuake) who makes constant stereotypical ribs about white people and Mexicans. Carmen shows him how to handle Max on leash, and the once angry kid becomes closer to dog. Until Tyler shows up and plays to the sympathy of his parents, telling the dad that Max was the reason for Kyle's death. The story then jumps the shark by Tyler's manipulations and Justin's discovery of Tyler's criminal plot. It all pretty much goes downhill from there. But it does give a reason for the dog to show his Marine skills at tracking, running, and fighting nasty pittbulls. And of course the total love and protection for Justin. It's a “feels” movie. Justin is a bit of a punk and you just want to slap him across the head when he gets all mouthy to his parents. Teenagers, gosh. Mom is all churchy and understanding. Lauren Graham is wasted in the movie until she gets one scene where she schools the police. Thomas Haden Church is your typical self righteous dad who loves his son but can't seem to connect. Max, as played by eight different animals (you may find yourself watching to see if you can tell when they change) seems smarter than the humans in the movie. It's a good family flick that should have been on TV.